Are there cartridges with the code number 346 for colour and 2710 for black. This is for the HP 6315 printer? These do not appear to be UK region printer cartridge codes., If your HP Officejet 6315 printer was purchased outside of he UK then the cartridges that we supply will not be compatible. Printers are set to regions and only cartridges purchased in the same country as the printer will be compatible. Is it time for you to buy new HP 6315 printer ink? One of these days your HP 6315 will run out of printer ink, and then you'll soon see that ordering HP 6315 ink is typically quite costly. Thank goodness you don't have to get worried about coughing up the high fees you'll see on the main street because here at Cartridge Save you can buy all the HP 6315 cartridges you'll want at very small prices. Start saving cash on your ink by purchasing with Cartridge Save! There's no point in spending so much on the 6315 original cartridge or 6315 compatible ink on the high street when it is far more straight forward to save a load of money ordering with Cartridge Save. Have perfect peace of mind by ordering your OfficeJet 6315 ink cartridges from us because they are all protected by a no quibble money back guarantee. Don't forget that every single purchase comes with free delivery, generally arriving at your doorstep on the next working day! Ideal for home offices, the HP Officejet 6315 delivers long-lasting photos and laser-like documents. It also boasts superior scanning, photo copying, and faxing technologies. It uses inkjet colour printing technology and digital copying, and boasts a monthly duty cycle of 3,000 impressions – certainly good enough for an average-use small office. The 2-line LCD display looks obsolete, though, and connectivity is limited to wired Ethernet connection. With dimensions of 18 x 12.8 x 9.3 inches and weighing 17 lbs., the HP Officejet 6315 seems a bit bulky. It features an automatic document feeder, which has a capacity of 35 sheets. The input tray has a capacity of 100 sheets, while the output capacity is 50 sheets. The flatbed scanner is on top. The HP Officejet 6315 integrates convenient USB 2.0 full speed ports on the front and the back and supports PictBridge for direct printing from a camera. An optional Bluetooth can be used, and the Ethernet connection supports networking for work groups. The HP Officejet 6315 can be used for both MAC and PC computers and devices. 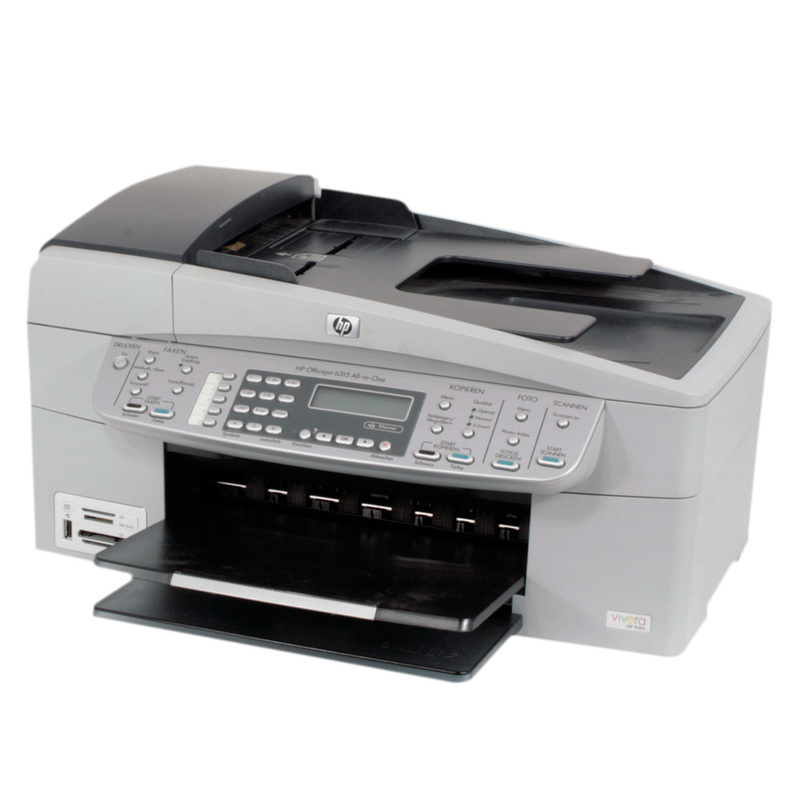 Some users have trouble with the software that comes with the HP Officejet 6315. It is a bit hard to install and is picky in terms of compatibility with operating systems. It is certainly behind other printers with colour LCD screens and built-in Wi-Fi, having only a 2-liner LCD display and Ethernet connection.